Spring drops her magic mantle and the Lehigh Valley comes alive. Blossoms escape soil frozen stiff only days earlier, and grass turns green, overwhelming the dull browns of winter. And as each day grows minutes longer, with sunshine conquering April showers, the arrival of Easter brings its rich traditions to church and home and marketplace, where colorful candy and flowers and new clothes move to the forefront. The celebrations of spring’s arrival reach back to the beginning of time, when man welcomed – heartily – the arrival of green shoots that would soon mean food and flowers. Ancient civilizations built myths around the lives of gods and goddesses who were tasked with controlling the growing seasons. Easter festivities date from the Holy Land after the Resurrection, when Christians updated pagan symbols. Traditions have survived and thrived, if only in modified form, as over the centuries people have joyfully greeted the warmth of April. The egg continues to remain a powerful symbol of rebirth, fertility and abundance, though no one knows when or how that came to be. Ancient Greeks and Romans took up traditions already in place and later – enthusiastically adapted by Christians – the customs morphed into today’s decorating of eggs (some edible and some not) and baskets filled with chocolate eggs, all edible. The art of the decorated Ukrainian egg or the pysanka, with designs created with beeswax, probably dates to ancient cultures. Ukrainians worshipped a sun god who brought warmth and so they decorated their eggs with nature symbols. Later, as Christianity matured, they either incorporated those symbols or replaced them with crosses or other religious designs on the pysanka, seen frequently in the Lehigh Valley. The Easter bunny, as we have come to know it, as well as colored eggs were first brought to America by Germans who settled in Pennsylvania. 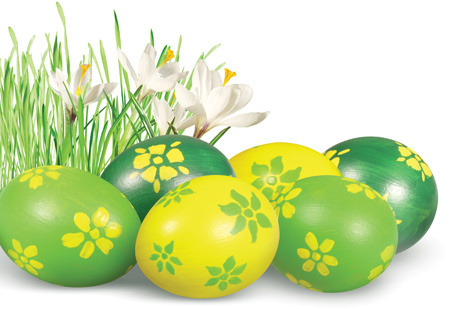 During the Middle Ages, a rabbit they named Osterhas placed brightly colored eggs in nests children made in their caps and bonnets. Only those children who had behaved well found their nests filled with colored eggs. That rabbit was a descendant of the hare, a sacred animal of the second-century Saxon goddess, Eastre, who was feted in spring and from whose name Easter was taken. In addition to the egg, bunnies, chicks, lambs and other baby animals born in spring became Easter symbols. Easter candy often comes in these shapes and butter is often served in the form of a lamb. Marshmallow peeps have reached iconic status since their introduction in 1953 by Just Born. Russian-born candy maker Sam Born moved his factory from Brooklyn to Bethlehem in 1932, and adapted his marshmallow treats and Teenee Beanee jelly beans from a small candy company he bought, according to Cindy Glick, Just Born marketing director, who notes that Just Born makes 4.2 million peeps every day. Originally yellow, they now also come in lavender, blue and green. The peeps have roots in the past as do jelly beans. A new season demands new clothes—and while that has not changed over the centuries, what has changed is the style. Fussy dresses, while still available, have mostly gone the way of the toga, and a more casual look reigns for both children and adults. Catherina Walsh is manager of the new Talbots Outlet at the Shoppes at the Sands Casino Resort in Bethlehem. The 3,200-square-foot store opened in November and carries casual fashions, she said, different from the more formal styles at Talbots. She said spring fashions will be softer, more flowing. Olesen said little girls’ Easter bonnets this year tend to be “little crocheted hats that look like flowers” instead of the classic flower-bedecked straw. Milk and Honey Kids Inc.